Best Price Guarantee | Vegas.com: If you purchase your tickets via the link provided on this page and find a better price for The High Roller option purchased, Vegas.com will match the competitor's price and refund the difference. That’s customer care you can count on. The High Roller in Las Vegas isn't your average Ferris wheel. And it's not really a Ferris wheel; it's an observation wheel -- the biggest in the world at a staggering 550-feet-tall. Yes, you read that right: 550 feet. That's nine feet taller than the Singapore Flyer and 107 feet taller than the London Eye. It currently holds the Guinness World Record for largest observation wheel. 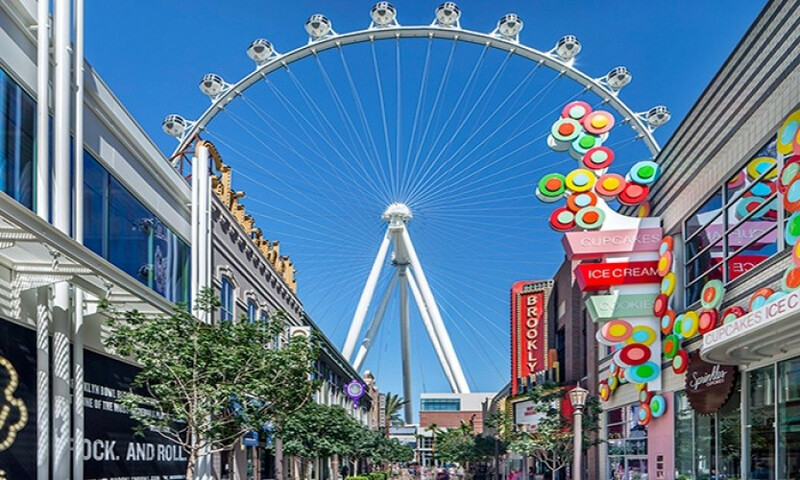 Located at the heart of the Las Vegas Strip, the High Roller is the focal point of the $550 million open-air shopping, dining and entertainment district, The LINQ Promenade. It's a sight that can't be missed. Literally, you can't miss it. The High Roller is comprised of enclosed and air-conditioned transparent pods holding around 40 passengers each. The pods are roomy with a couple benches and the ride is smooth, not typically bothering those with a minor fear of heights. The High Roller is accessible from The LINQ via multiple entrances, including a back porte cochère off of LINQ Lane. The Las Vegas Monorail, meanwhile, cruises right in front of the High Roller with convenient stops at both the Flamingo and The LINQ. Includes 1 ride during standard daylight operating hours. Includes 1 admission to the Eiffel Tower and 1 admission to the High Roller during standard daytime operating hours. Includes open bar with beer and mixed drinks for adult riders (ages 21 and over, ID will be checked upon arrival). Valid during standard operating hours of your choice.